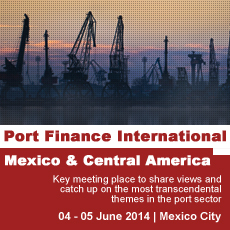 Port Finance International Mexico 2014 is a key meeting place to share views and catch up on the most transcendent themes of maritime port sector. This forum is a space that allows knowledge exchange, proposes strategies and viable solutions intended to strengthen the industry and discuss the successful implementation and execution of projects in the sector. The aim of the forum will bring together the major players in the port sector to discuss the current challenges and opportunities in the sector as well as how to carry out a successful development of the Mexican ports in order to it to be a logistics platform for international trade and a competitive international player. Mexico’s port cargo is expected to increase 80% to 508 million metric tons per year by the end of the government’s current six year administration in 2018, compared to the current 282 million tons of cargo moved annually. The rising demand for port services will increase the need for new cooperation between the public and private sectors. Currently, business focus on the construction and operation of specialized terminals, but the Mexican government wants tofurther promote the development of basic infrastructure, such as work on breakwaters, dredging, protection and access and maintenance of terminals. As a result, the government plans to explore PPP to strengthen basic infrastructure in the ports of Veracruz and Mazatlán. In the medium term the government expects to see increasing participation of the private sector in other areas such as logistics infrastructure, scrapping facilities and shipbuilding.